The figures for World Cup Cricket 2007 are in and by all reports hardly any of the funding has come from the proverbial ‘taxpayers’ dollars. The public had been clamouring for the figures, claiming that monies spent on the entire event could never be recouped by ticket sales and as such would have been a huge investment flop for the Federation. Minister of State responsible for Tourism, Sport and Culture, Hon. Richard ‘Ricky’ Skerritt is endeavouring to set the record straight. “I have been involved in the planning of our hosting CWC 2007 since inception and we have been keeping very close tabs on the cost of this momentous event. St. Kitts expenditure is comparatively low in terms of actual taxpayers’ money spent,” Skerritt said. The estimated expenditure for Cricket World Cup is EC$48 million, which incorporates the cost to construct the stadium, the overlay work, and the practice venues. Skerritt outlined the breakdown of the expenditure, pointing out that the figures were not an official tabulation but that the figures were reasonably on target. “In terms of the Local Organising Committee, we managed to keep cost down by maintaining minimal staff. In other countries their LOC staff is quite large. Luckily our people have volunteered of themselves to do jobs that their counterparts in other islands get paid to do. We here understand just how much this event means to the people of St. Kitts and the country itself. Since the initiation of the LOC in 2004, it has cost 8.5 million dollars,” Skerritt said. He explained that the high level of volunteerism helped to keep costs down while at the same time developed skills in logistics management; skills he said that every community needed. Another benefit derived from the hosting of the matches was creating a cadre of people who now had the management expertise and could train others, Skerritt said. 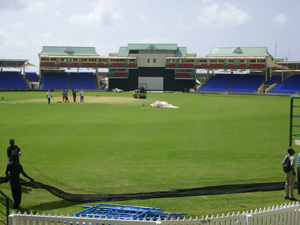 Other expenditures incurred to make St. Kitts’ hosting of World Cup Cricket 2007 a reality include the 2 million dollars spent on the Len Harris Academy, equipment, and the Conaree and Cayon practice grounds, the 6 million dollars allocated for the football stadium, and the 8.5 million dollars spent on the overlay work. The overlay itself was not limited to the erection of temporary stands but incorporates the media facilities, the broadcast facilities, catering facilities, power generation equipment, fan zone and accreditation centre. The cost to construct the stadium itself was 23 million dollars; an expenditure Skerritt said was justified and necessary in order to meet commitments. “We tried to keep costs to a minimum and the cost for the stadium has been relatively low per spectator. Unlike a lot of the other venues, the construction of our stadium was heavily subsidised by the Taiwanese. So in essence, very little of the monies spent were actual taxpayers’ dollars, despite criticisms to the contrary,” he noted. The expenditure for most of the other host countries has superseded that of St. Kitts and Nevis. St. Vincent, which is only a practise venue, has spent more money on their stadium alone than the Federation has spent for the entire event. In comparison, Barbados has spent approximately 150 million dollars to construct their stadium and Jamaica’s figures far surpass those as well. Skerritt pointed out that the benefits created through hosting the event went far beyond a financial statement. “The value of the human resources development alone is not something you can put a price on. That stadium puts in contention with other territories to host future international sporting events that we could not have dreamed of bidding for in the past. The monies spent to construct stadiums, fix roads and all the other work that had to be done to get us ready for the event was reincorporated into the economy. Locals were employed to carry out the construction work, caterers will benefit, hotels will benefit, suppliers and other folks will benefit from this undertaking,” the minister said. “There are mischief-makers out there who are claiming that we won’t have a full stadium and so the event would have been a loss for the economy. Ticket sales are only a small part of the overall benefits that this country will see as a result of hosting Cricket World Cup. The event will put us on the international sports map and the exposure that the Federation will garner, one cannot possibly put a monetary value to that,” Skerritt stated. He said that an official tabulation on the expenditure incurred for hosting the event would probably be completed by June of this year.